Sometime last week I decided the Georgia needed a Valentine's Day Sweater. Why? I don't know. I'm not a particular fan of it or anything, but maybe just because I wanted to make something quick and pink? Either way, I whipped up a little Flax Sweater and used up some of my wool ends in the process. I really love the pattern, it's simple without being boring and has a killer neckline, but for every other aspect I pretty much just went against everything I believe in. 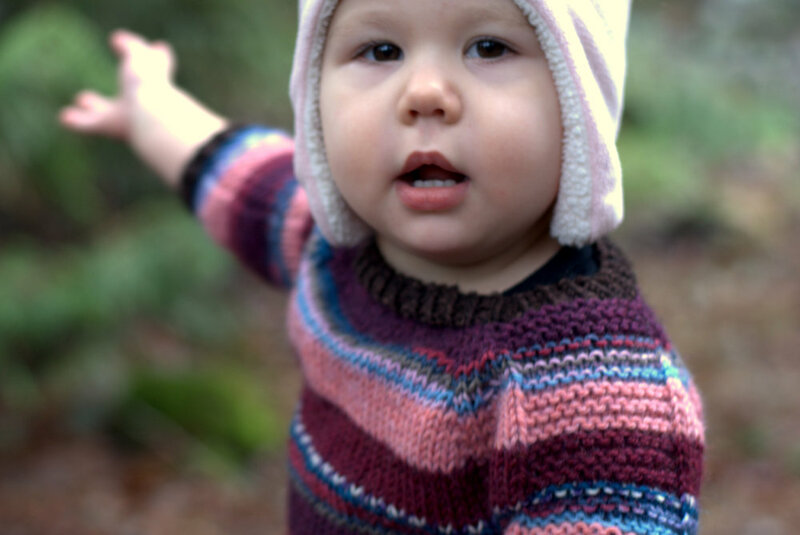 From the colours, to the stripes, to the variegated yarn that was bought on a whim, nothing was what I would ever really do if I was planning a sweater. But I just went with it. Those were the colours I had that kind of went together and while there was certainly a point where I thought "this is absolutely ridiculous, I should just frog the whole thing", I carried on. And I'm in freaking love. What I was sure was going look like the hodge-podge mess from grandma on Christmas that gets wore once and then lives at the bottom of the closet turned into, well, a hodge-podge mess. But a hodge-podge mess with a wicked 80's vibe. Throw Georgia onto the set of The Goonies or E.T. and you would never know the difference! 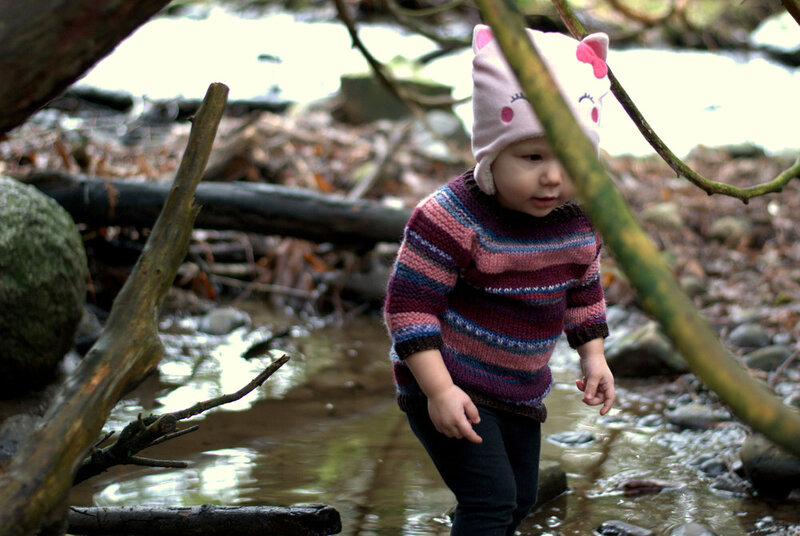 It turned out way cooler then I thought it would and while I could never pull off a pink and purple, 3/4 sleeve, tunic length, horizontally striped pullover while wearing a kitty hat, Georgia is two and she can pretty much make anything work. See all the photos and yarn details on my Ravelry Project Page.